Drinking cup; silver-gilt; cylindrical body with etched design of hunting party; sign of Leo in the sky; lower part with oval bosses; short stem with recumbent man and woman in frames; foot with scrollwork with three human and three lion masks; inscribed. Origin: Nuremberg; late 16th century; mark of Hans Beutmüller (master 1588, died 1622). (ii) The half-wheel quartered with the three labels within a shield punch of Hans Beutmüller (R3 4054/5). These marks are punched close together near the rim on the side of the cup (above the cornfield, on the extreme left). Commentary: Like Caspar Beutmüller the Elder, the maker of this stacking-cup also came from Venice and became a master in Nuremberg three years after Caspar I. For a discussion of this class of silver plate known in Germany as ‘Satzbecker’, and the technique of etching which in Read 1902 and Dalton 1927 had been stated to have been used on this stacking-cup, see WB.146. For another similar stacking-cup by Hans Beutmüller, see the Christie's sale catalogue of the Lamon Collection (28 November 1973, lot 55 with illus. ); although it has the identical stem, the elaborate foot incorporates six Signs of the Zodiac and the upper zone of the bowl is engraved with scenes in three oval panels. The great similarity between the Leo stacking-cup and WB.146 (Scorpio stacking-cup) led to the suggestion in Read 1902 that they “formed part of a set of twelve, each with a sign of the Zodiac”. Certainly, Hans Beutmüller may have worked in close collaboration with Caspar I, perhaps even sharing the same workshop, but there are sufficient differences between the two drinking-cups to indicate that they might have belonged to two different sets of twelve. The decoration of the embossed foot is noticeably less sculptural than on WB.146, and the stems, though not dissimilar, have significant changes in detail. The spandrels on the lobed area of the bowl are not alike, the rims are finished in quite different ways, and even the interiors (at the base of the bowl) are not the same. If these two cups had been completed at the same time to form a set that had been commissioned by a particular patron, it seems unlikely that the punch-marks on the one should be stamped on the base of the bowl and those on the other cup should be punched on the side where they are quite obtrusive, even though they are not struck on top of the incised design of the hunting frieze itself. Whilst there remains a remote possibility that these two cups could have formed part of the one set if, by chance, the particular patron was either in a hurry or not too concerned with the effect, these stacking-cups with the Signs of the Zodiac were more usually a perfect matching set of twelve. Because of the close relationship between Caspar I and Hans Beutmüller, it is not in the least surprising to find that they were both making very similar sets. Since it is extremely difficult to detect any significant change in quality when comparing the two friezes, after due allowance has been made for the effect of using two very different subjects, it may be assumed that both Caspar I and Hans Beutmüller not only shared the same workshop at this time but also shared the same artist to decorate these sets of stacking-cups. The practice of employing specialist craftsmen, such as engravers, to execute one particular aspect of a commission was particularly widespread among the more successful German goldsmiths, whose workshops were busy with orders. Hunting scenes of the kind used to decorate this stacking-cup abound in German decoration during the second half of the sixteenth and the early decades of the seventeenth century; they can be found on a vast range of objects with an almost infinite number of minor variations. Many seem to be based to a greater or less extent on the engravings produced in the Nuremberg workshop of Virgil Solis (1514-62), perhaps the largest disseminator of designs north of the Alps in the middle decades of the sixteenth century. Not all the designs can be regarded as his own invention, since he appears to have engraved and published the designs of other artists without any acknowledgement. For a recent monograph dealing with this complex problem, see I. O'Dell-Franke, ‘Kupferstiche und Radierungen aus der Werkstatt des Virgil Solis’ (Wiesbaden, 1977), where, for example, some twenty engravings of hunting scenes in the form of 'friezes' (nos g. 19-30, pls 73-5; and nos ex. 58-9, pl. 168, ex. 69-74, pl. 170) are full of motifs that can be seen, often in a slightly altered form, on this stacking-cup. The exact graphic prototype for the 'frieze' (as it is precisely arranged on this cup) has not yet been found among Virgil Solis's engravings, but Hans Beutmüller's workshop may have been capable of creating their own individual version by carefully borrowing from a number of different engravings - even perhaps using the drawings of contemporary artists, such as Jakob Züberlin's sketch of c. 1590 (Art Institute of Chicago - discussed in H. Geissler, Zeichnung und Zeichnen, ‘Die Renaissance im Deutschen Südwesten’ exh. cat.. Heidelberg Castle, Badisches Landesmuseum, Karlsruhe, 1986, pp. 312-13, fig. 14). Perhaps the most historic and spectacular piece of plate by Hans Beutmüller which has survived is the tall standing-cup and cover- the famous St Martin's Welcome Cup of the Fraternity of St George in Elbing, which he made in 1604. After 1945, this important masterpiece remained in private hands until 1971, when it entered the Altonaer Museum Norddeutsches Landesmuseum, in Hamburg-Altona (see Günther Schiedlausky, Der Martins-Willkomm der St Georgen-Brüderschaft in Elbing, ‘Jahrbuch der Altonaer Museum in Hamburg’, 1972, vol. 10, pp. 9-78). The combination of techniques, all employed with consummate skill on this monumental piece of plate (H. 86.7 cm), establishes Hans Beutmüller as a gifted rival to Hans Petzolt, who was at that time pre-eminent among the Nuremberg goldsmiths. Hugh Tait, 'Catalogue of the Waddesdon Bequest in the British Museum, II : The Silver Plate', British Museum, London, 1988, no. 39, figs. 204-208. 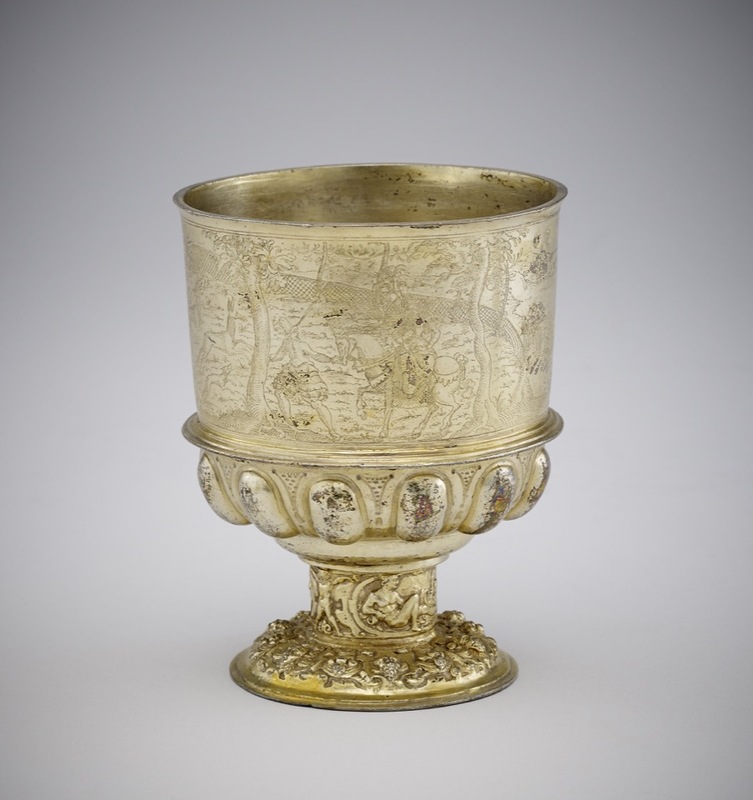 A covered silver-gilt cup by this maker (marked), is in the Kremlin. It was presented to the Tsar by the Swedish envoy in 1647as a gift from Queen Christina. This is one of several in the Swedish Treasury admired in 1634 by the French diplomat Charles d'Ogier. See Barry Shifman and Guy Walters, 'Gifts to the Tsars, Treasures from the Kremlin', Indianapolis 2001, ex cat., p.272, cat.79.